In this week the archangels and angels guide us to trust in our own inner knowledge and to act upon it without hesitation or delay. Give over your worries to them and ask for any specific guidance along the way. Listen and watch carefully for signs and messages especially if they are repetitive. You are also assisted by loved ones who have passed over as they are committed to your peace and success as you are. 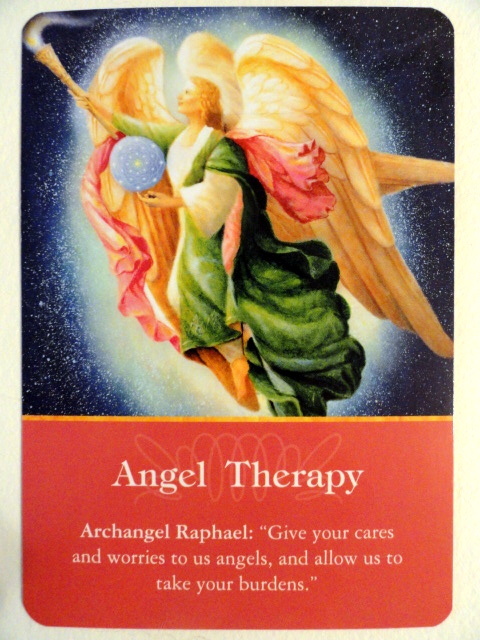 Angel Therapy: Archangel Raphael: Give your cares and worries over to us angels, and allow us to take your burdens. The angels are always available to help you with any situation in your life right now. All you have to do is ask. They can only assist you if you ask them. All you have to do is close your eyes and take a deep cleansing breath and mentally ask for help. Try not to be attached to the outcome, or what the form of guidance or message will look like. Know that just as you give an order to your waiter for your food in a restaurant, you only have to ask them once. Then be open to receiving an answer and guidance. The help may be in the form of a hunch, an intuitive idea, or a direct intervention. If you receive any repetitive guidance, it’s important that you follow it without hesitation or delay. Ask Raphael to surround anything needing healing with his emerald green aura. The crystals that are aligned with Raphael’s healing energy are emeralds and malachite. 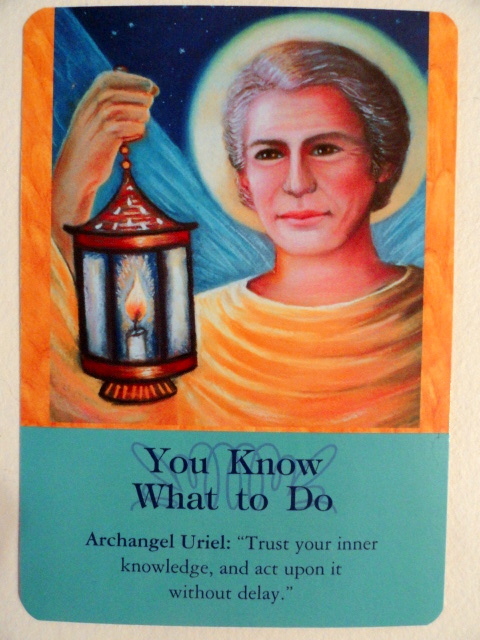 You Know What to Do: Archangel Uriel: Trust your inner knowledge, and act upon it without delay. Here you are being asked to embrace the infinite wisdom and inner knowledge you already have. Also Uriel is asking you to acknowledge that you are far more wise than you may think. Here you are are being guided to trust yourself more. If you have any doubts you can ask Uriel for clears signs to validate your thoughts and ideas. Uriel can also help you to take actions with these ideas one step at a time. So you may not see the whole picture of where it is going. But you will know what step to take next – all along the way- with Uriel’s help. 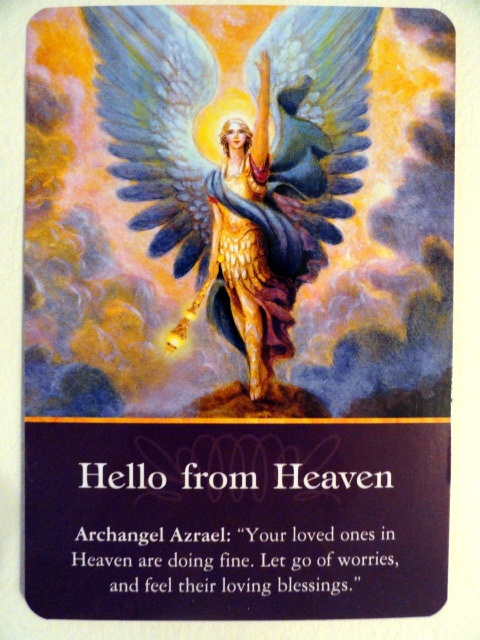 Hello From Heaven: Archangel Azrael: Your loved ones in Heaven are doing fine. Let go of worries, and feel their love and blessings. This is a beautiful message that your loved ones who have passed over are wanting to support and assist you in being peaceful and happy. They want you to know that they are fine. They are also want you to know that they are very near. If you have a feeling that they are near you, they are. Your loved ones want to work with your guardian angels to help you be peaceful, so watch for other signs from Heaven. You can ask Azrael to bring you a message or dream visitation from your loved ones in Heaven. Azrael is known as ‘Whom God Helps’, whose role is to assist people in crossing over with loving light.